Do you fit the profile for your generation? Do you have Millennial values? Boomer values? 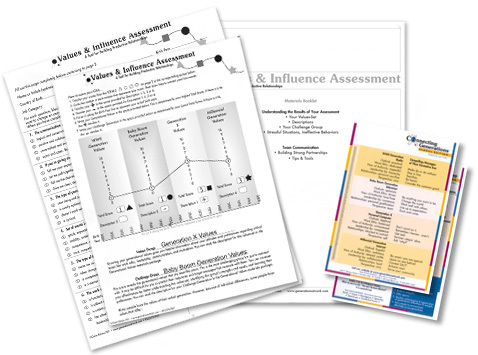 The Values & Influence Assessment™ is a powerful interpersonal communications tool focusing on values and the impact they have on results. It goes beyond birth year to assess personal values. Participants complete a brief, one-page questionnaire online before the session or on paper during the session. A personalized score sheet graphs their four scores and displays their primary values group as well as their challenge group. Assessments are available online on our website. If you prefer this format, we will send you a user name and pass code so your participants can access the assessment electronically. Once they have completed the assessment and submitted their answers, they will automatically receive an email with their results and supporting materials.